This is a mural that adorns the Department of Labor in the state of Maine. Measuring 8′ high by 36′ long, it was created by Maine artist Judy Taylor in 2007/2008 to commemorate significant moments in Maine’s labor history, including the adoption of child labor laws, better working conditions for all workers and the increasing signifigance of women in the labor force. It also memorializesMaine native Frances Perkins, who was the Secretary of Labor under FDR, the first female to hold any cabinet post. It glorifies the plight of the worker in an appropriate setting, the Department of Labor, and is a striking and significant piece of public art. Maybe it’s just me but this seems like a no-brainer but recently this mural has come under attack. Maine Governor Paul LePage (R) has ordered that is be taken down as he has had complaints from business factions that it is unfairly biased against business owners. As proof, they released an anonymous fax signed “A Secret Admirer” who claimed that he felt he was in North Korea viewing public political propaganda and this was nothing more than an effort to further the Union movement. The governor also plans to change the name of several meeting rooms in the building named after people in the Maine labor movement. From looking at the mural and its short descriptions of each panel ( to do so, click on the image above and it will take you the artist’s site), I saw only moments of history that elevated the average worker and protected the vulnerable from exploitation. How anyone could see child labor laws as being biased against business and not a positive step forward for our society is beyond me. And this is in the Department of LABOR. But there is a movement afoot to squash the labor movement, mainly trade unions, in this country which many think people will not affect them and their lives. After all, how many people are union members today? But there is more at stake with this attack than the rights of the unions. It is both a beginning erosion of the rights we have garnered through the efforts of labor unions and others in the past and a political maneuver to destroy the only organized group that represents the worker in any political sense. Unions are the only organized political donors who somewhat check the unbridled money injected by business concerns into the political arena. And even the money spent by unions pales in comparison to that spent by businesses and their lobbyists. But it is still opposition and must be destroyed and this move by Gov. LePage is symptomatic of this effort. Demonize and destroy. I might have a kinder eye toward the efforts of LePage and his ilk if they gave me a reason but all I can see is that our manufacturing base has been stripped away and moved to places around the world where these companies can operate like they were mill or mine owners in the 19th century. I have even heard recent rumblings that child labor laws are considered unconstitutional in some circles. These political leaders seem bent on doing whatever they can to take us back to a pre-union world and this small effort to take away an innocuous mural in a government building (the Dept. of LABOR!) is yet another step. We must continue to speak out against this sort of action. Sorry for straying into the political world but they baited me when they crossed into the art world. I had promised myself that I would stop interjecting political views into this forum but watching the events of the last week taking place in Wisconsin and across this country has forced me to break that promise. Labor is, and has been for some time, under attack from the so-called captains of industry and their minions in government and that is truly a tragic event for the working class of this country, many of whom have no idea of the history behind the labor movement. Most don’t realize that many of the things they take for granted in the workplace , like a 40 hour workweek and minimum wages, are there because of workers from prior generations banding together to demand tolerable working conditions and a living wage. They can’t see that unions have raised the boats of all workers, union and non-union. This nation has been seeing a decline in the middle class for some time now, with there now being the greatest disparity in wealth between the upper and lower classes since the years just before the Great Depression. It has been shown historically that we prosper as a whole when the workers of this country prosper and the workers are under attack now. We have been convinced in the great echo chamber of the media controlled by powerful corporations that taxcuts and bailouts for corporations (the faceless captains of industry) are acceptable and necessary, costing us countless billions of dollars. It is forbidden to ask corporations making billions of dollars in profits to pay their true tax liabilities without concessions but to demand that the rights and benefits of those with the least power, the workers, be sacrificed is acceptable. Those in power, and those who kowtow to them, will always seek more and more from those they hold power over and will use all the means within their reach to hold on to this staus quo. As King said, the prosperity of the middle class was not given freely by the captains of industry. They were forced in to it and the nation as a whole, the powerful included, benefitted. There’s so much to say on this subject, so many words to spew out about the value of the working class and how we must lift it back to its feet if we ever hope to once again see widespread prosperity in this country. Too many for this simple blog. This is not a small fight in Wisconsin. It affects all America and should not be taken lightly. Unions have long been demonized and, admittedly, have had some problems. But we need the unions if only as a firewall against the ever increasing greed of the powerful and to give many small voices a larger voice. As the great Union leader John L. Lewis said: Let the workers organize. Let the toilers assemble. Let their crystallized voice proclaim their injustices and demand their privileges. 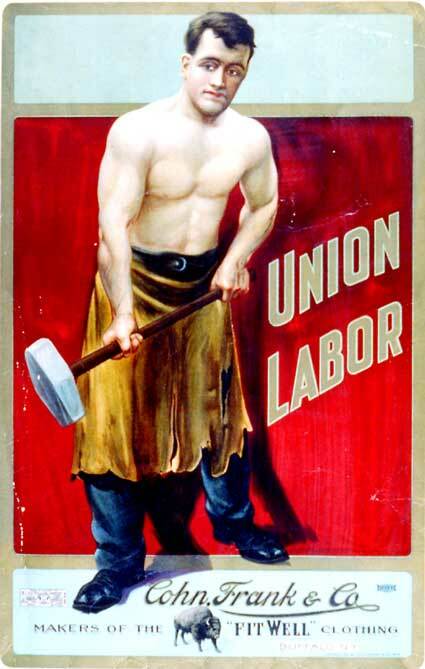 Let all thoughtful citizens sustain them, for the future of Labor is the future of America. Make no mistake: What is at risk in Wisconsin, and every state in America, is the quality of life that American workers have fought — and died — for during the past century. When plutocrats like the Koch brothers tell the governor of an American state to roll back the clock on public employees, they are seeking to end protections for all workers. The Kochs are part of an ideological movement that hopes to end all legislation controlling wages, hours, and workplace safety — returning America to a “Social Darwinism” that ensures survival of the fittest (read: richest). This is the constitutional theory that prevailed before the New Deal. To these extremists, Ayn Rand is on par with James Madison. If you can, plesase check out this article.